Has any one seen this golfer before? Top… Top… Top…. “Why can’t I keep my head down?” Chunk… Chunk… Chunk… “My head came up again.” Top…Top…Top… and so the devestating cycle continues. 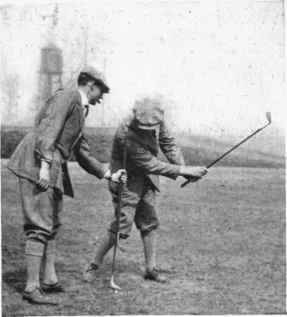 They have been told 1,000 times by their spouse, parents, or friends that they continue to raise their head, as well as take their eye off of the golf ball. The golfer might get so upset that they can’t keep their head down, that they might even consider quitting. Here is a great video I did with GolfGuruTv host Jason Sutton that shows the most probable cause to topping the ball, as well as how to fix it. The head does not stay down. It pivots and follows the ball! This allows the body to turn through the shot with a better chance of keeping the shaft leaning forward. Stay tuned to the next post where I’ll go over the top three reasons golfers top the ball and how to fix them. If you enjoyed this post and want to learn more please visit our website at http://www.andrewkiger.com or call 919-449-4274 to schedule a lesson. Hey cool article! I had a chance to talk to Darren May who teaches Robert Allenby. Allenby like Annika does not look at the ball at/after contact. I asked Darren why he said Robert grew up playing golf in Australia and his home course had poor drainage hence very wet conditions. Robert would follow the ball with his head to avoid mud splashing in his face. This came up again today with another student. Please read this to spread the word.